Social Media Abyss plunges into the paradoxical condition of the new digital normal versus a lived state of emergency. There is a heightened, post-Snowden awareness; we know we are under surveillance but we click, share, rank and remix with a perverse indifference to technologies of capture and cultures of fear. Despite the incursion into privacy by companies like Facebook, Google and Amazon, social media use continues to be a daily habit with shrinking gadgets now an integral part of our busy lives. We are thrown between addiction anxiety and subliminal, obsessive use. Where does art, culture and criticism venture when the digital vanishes into the background? 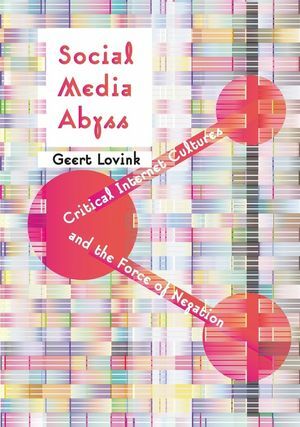 Geert Lovink strides into the frenzied social media debate with Social Media Abyss - the fifth volume of his ongoing investigation into critical internet culture. He examines the symbiotic yet problematic relation between networks and social movements, and further develops the notion of organized networks. Lovink doesn't just submit to the empty soul of 24/7 communication but rather provides the reader with radical alternatives. Geert Lovink is founder of the Institute of Network Cultures at the Amsterdam University of Applied Sciences and Professor of Media Theory at the European Graduate School. 1. What is the Social in Social Media? "For nearly thirty years, Geert Lovink has been the singular vanguard of net criticism. Zeroing in on what we are doing before we know that we are doing it, he poses the questions not that we should now ask but that we must ask next. Social Media Abyss is Lovink at his insightful, provocative, best." "Geert Lovink has set his laptop up in the internet cafe teetering on the edge of the abyss. Staring deep into that vortex, and catching sight of its many shiny whirling surfaces, Lovink's writing always reminds us of the fundamental pleasure and necessity of saying 'No'."